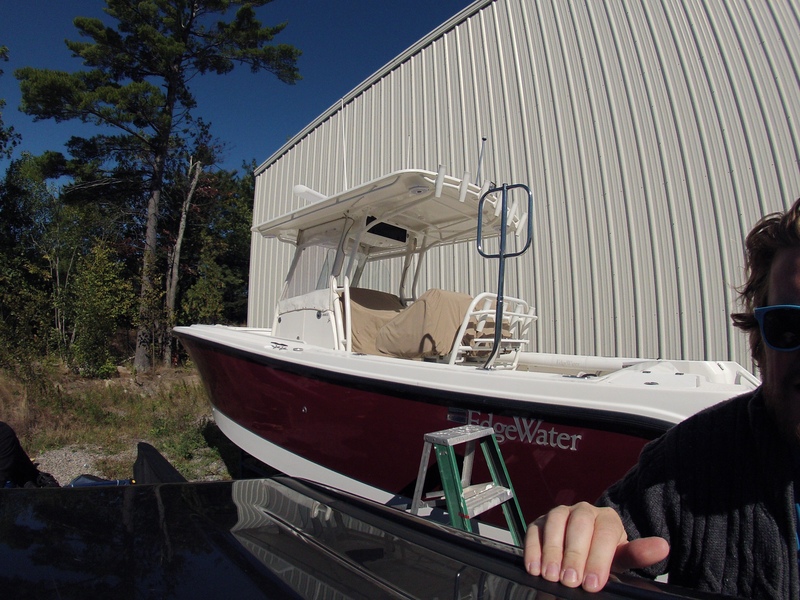 Sometimes the sun can be overpowering when you’re out on the water. The heat can get uncomfortable and it can also be damaging to your skin. If you have an open cockpit that needs shade, there is a solution with a custom kit from SureShade. SureShades can be installed on a wide range of cruisers and coupes and are ideal for open boats with T-tops like the Edgewater Centre console we were working with on this project. The project had started earlier when I when looked at the T-top in detail. 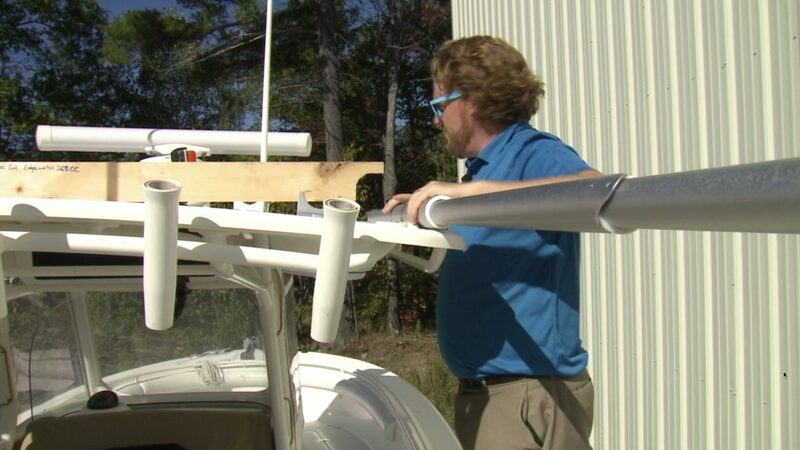 SureShades can be installed under or on top of the T-top. With a host of obstructions under, our only option was on top. I took pictures of the T-top and added measurements to the images and emailed them to SureShade. They sent us back a complete kit, customized for this application. In short order I unpacked the components and passed them up to Steve so we could get to work. First mounts were set fore and aft on both sides of the top and the extending tubes were set in place. The kit came with a wooden template to provide the correct spacing between the stationary tubes. We used the template both on top of the curved T-top and off to the side to make sure the spacing was spot on. Then it was time for assembly. First we installed the outer crossbar on the tubes. The fittings simply insert into the end of the tubes and are secured with Allen pan-head machine screws. Next up was the mid-crossbar that lies over the extending tube and is fastened with machine screws as well. 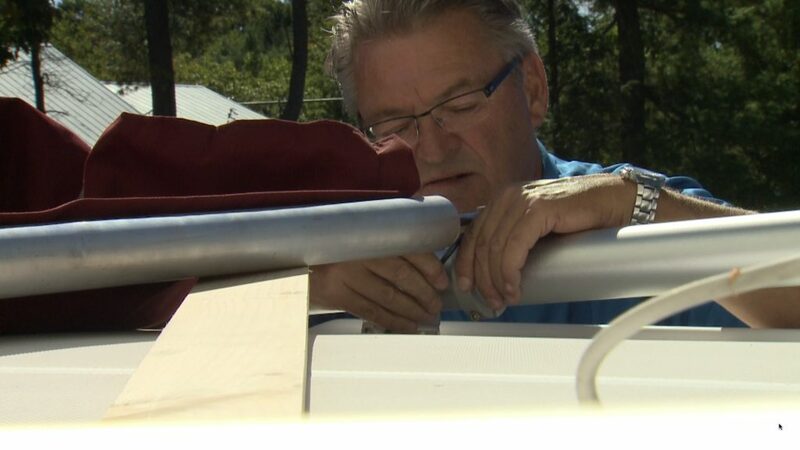 After unfurling the canvas from the roller, the roller shaft was inserted into the canvas roller and secured with two machine screws. On the starboard end of the roller, the hand lever and clamp were installed in the same manner. After removing half of each clamp, Steve and I lifted the canvas and roller and set it in place on the end of the stationary tubes of the system, then clamped each side in place. Next, we removed the outer crossbar and slipped it through the sleeve in the Sunbrella and reinserted the bar in the tubes and secured them. With that accomplished, we were able to retract the SureShade canvas and telescopic tubes in order to secure the system to the T-top. After checking measurements and positioning the assembly and bases multiple times, the locations for the aft mounts were marked. 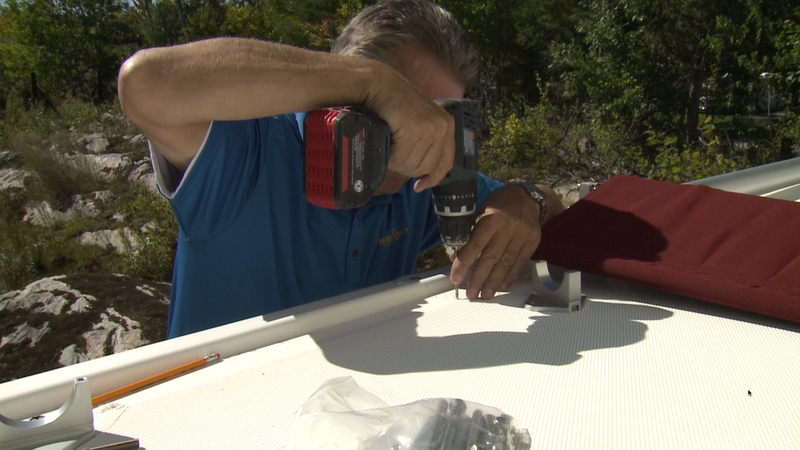 The SureShade assembly was cleared out of the way so pilot holes could be drilled for mounting the base. 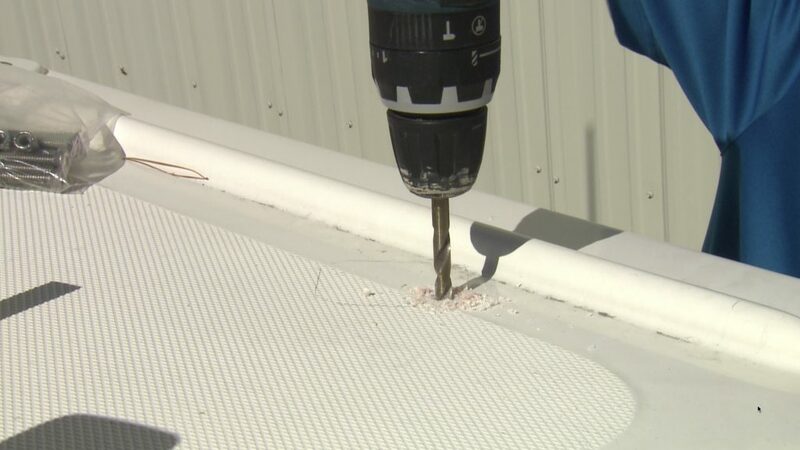 Tip: When starting to drill the final finished size holes, run your drill in reverse to cut into the gelcoat without the gel cracking or lifting. Drill slowly with even pressure to avoid splintering the glass and gelcoat on the underside of the hard top. With one bolt inserted in the aft port mount to hold it in place, the drilling process was repeated for the starboard mount. The drill bit sizes required are listed in the instructions that came with the kit. Again following multiple measurements to ensure that the tubes would be properly lined up, the assembly was set in its final position and the forward mount locations were marked. At this stage the remaining holes were drilled in the aft mounts then so were all of the holes for the forward set. With the holes done, the bolts were inserted. 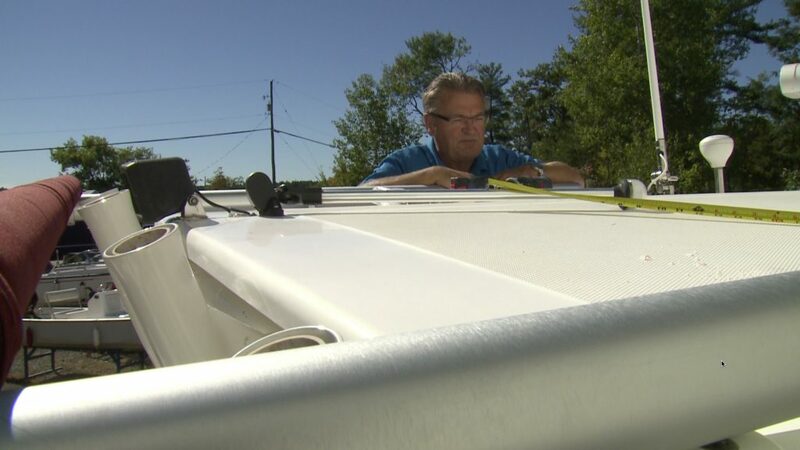 To ensure water would not get into the top’s core – a very critical step – every mount was bedded with 3M 4200 fast curing marine sealant and pressed into place. 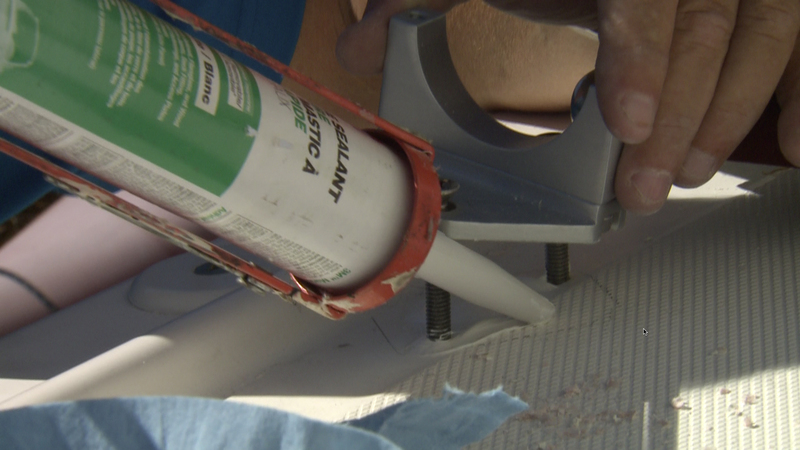 Make sure to use enough bedding compound so that it flows out from under the bases making a complete seal. 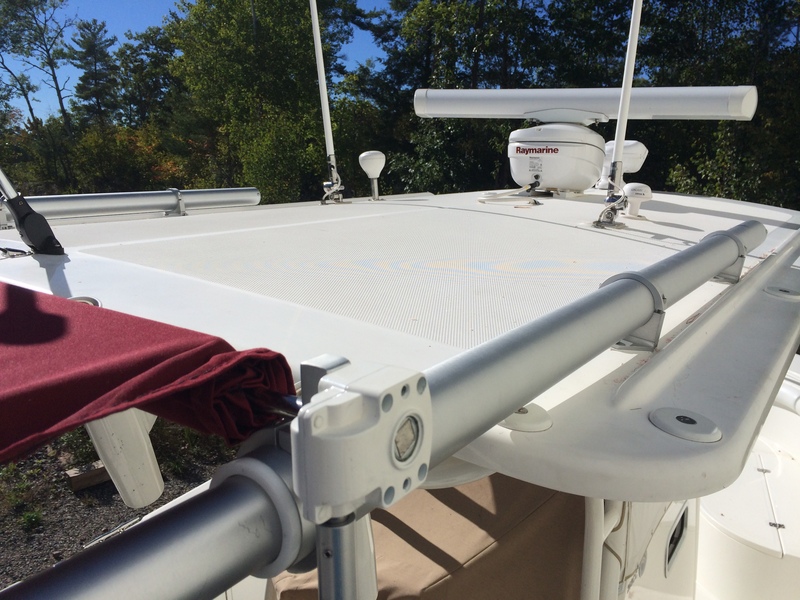 On the underside of the T-top, we slid backing plates over each set of bolts and hand tightened the lock nuts. A driver was then used to run the nuts up the extra long bolts that came in the kit, stopping early to leave room to apply the bedding. 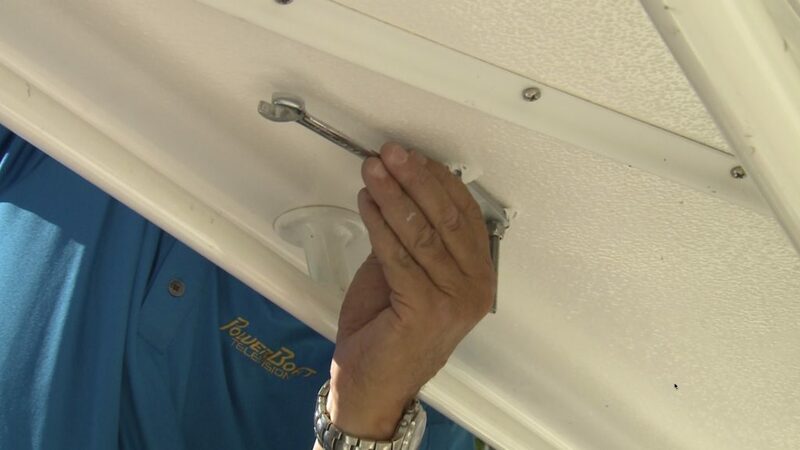 The long bolts are supplied to allow for various thicknesses of layups and framing on different boats (these bolts would be cut off and nylon caps slipped on later). After applying the sealant, the nuts on all four mounts were tightened down. We set the SureShade back in place and secured all four clamps over the stationary tube and locked it all down by inserting and tightening the machine screws. Extend the shade and hide from the sun! With several turns of the hand crank, the SureShade smoothly extended out over the cockpit. 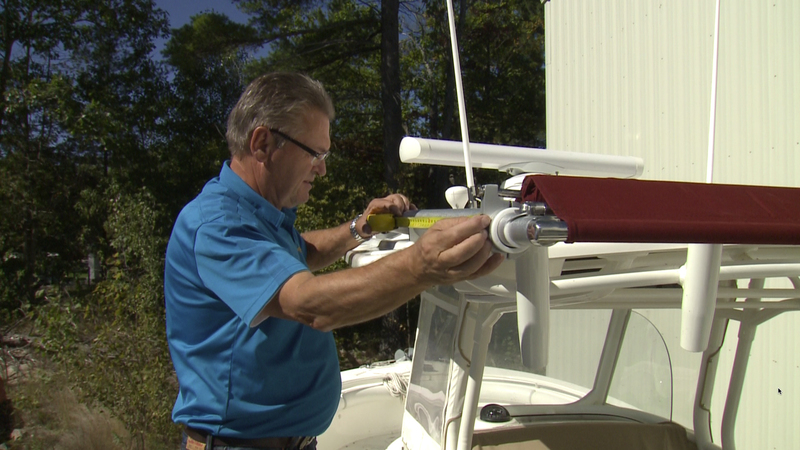 An electric deployment system is available for larger craft. 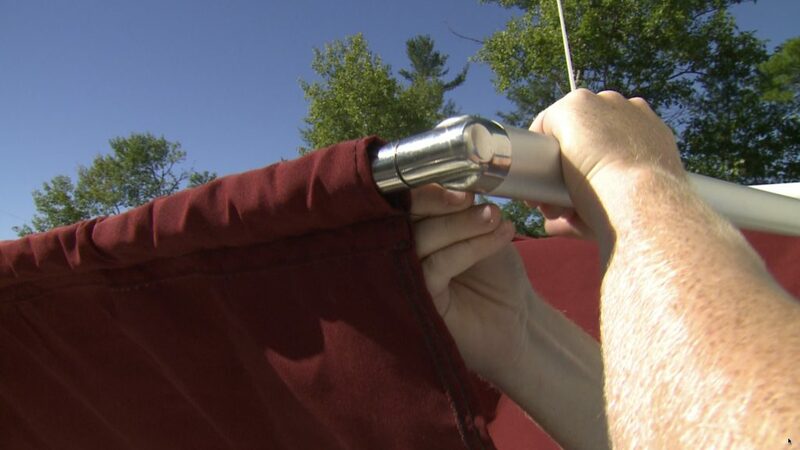 While not the easiest DIY project, the installation of the manual SureShade was straightforward enough and took two of us an afternoon to accomplish. 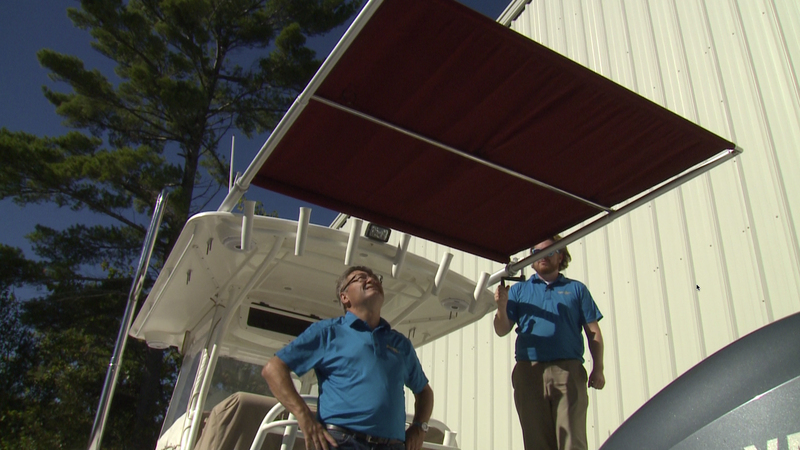 It’s definitely a worthwhile investment to keep the sun at bay on those long days on the water. 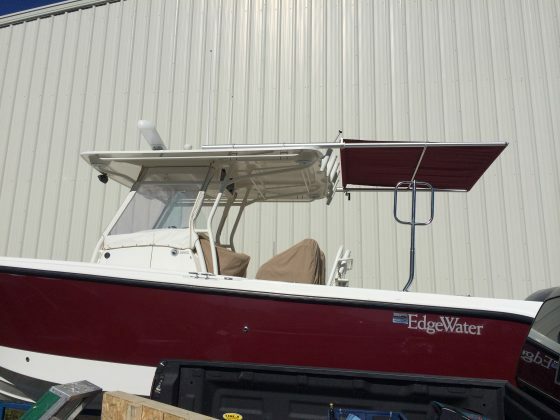 This project is featured in the Summer 2016 issue of Boats&Places.